ISLAMABAD: Islamabad High Court (IHC) has ordered interior ministry and NAB to submit written reply on putting the name of Zulfi Bukhari in Black list. Justice Amir Farooq of IHC conducted the hearing of the petition on Thursday. NAB prosecutor took the stance during the hearing that as many as four notices have been sent to Zulfi Bukhari due to off shore company but he did not appear in the court even he was present in Pakistan . 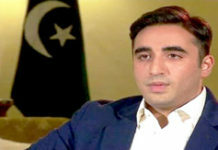 ‘’NAB had requested Interior Ministry to put the name of Zulfi Bukhari in ECL on 9th May but even NAB was not informed about the matter of putting the name of Zulfi Bbukhari in black list,’’ he added. He further said that Interior Ministry had allowed Zulfi Bukhari to go abroad for six days even the matter of inquiry was in the knowledge of ministry. The court inquired from the section officer of Interior Ministry that when NAB has said to put the name in ECL than why his name has been placed in Black list? ‘’Whenever a person is blacklisted, his passport has to be taken back. Have you taken the passport of Zulfi Bukhari back?’’ court added. Section Officer replied that we have not taken his passport back. Justice Amir Farooq remarked while expressing annoyance that law should be same for every citizen. ‘’The name is not removed from ECL for week even after the court orders. Allow common people to travel once like this case. The same activeness should be shown for the pubic like what has been shown in this case’’, he held. IHC has directed Zulfi Bukhari to appear in NAB inquiry while ordering NAB and Interior Ministry to submit their written reply and adjourned the hearing of this case till next Wednesday. Zulfi Bukhari has said while talking to media after the hearing that we respect the institutions. ‘’I will definitely go to NAB if I have to. I only have one passport. My name was included in black list not in ECL’’, he added. He further said that I was not informed about the reason for putting my name in black list and Imran Khan has not telephoned anyone to remove my name from ECL.